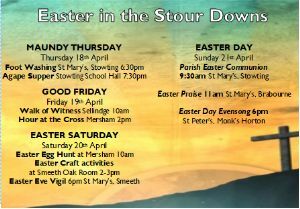 This Easter we celebrate Easter Day with a Parish Communion at 9:30am in Stowting, and also a non-communion Easter Praise service at 11am in Brabourne, on 21st April. At 6pm there will be an Easter Evensong at Monks Horton. On Maundy Thursday (18th April), we have a service of Foot Washing at 7pm in Stowting church followed by an Agape Supper in Stowting School Hall at 7:30pm. More details coming soon of this. Good Friday (19th April) is marked by a Walk of Witness at Sellindge starting at 10am from the church and ending at the Village Hall, and also an Hour at the Cross in Mersham Church at 2pm. An Easter Vigil will be held in Smeeth Church at 6pm on 20th April. 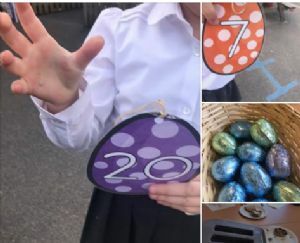 Also, there will be FAMILY FUN FOR EASTER SATURDAY on 20th April... Easter Egg Hunt in Mersham Church at 10am and Easter Crafts in Smeeth Oak Room 2-3pm. Download a Family Holy Week activity and reflection sheet here.